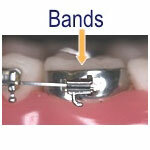 Bands: Round metal braces that go around the back molars. 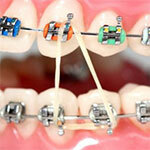 Braces or Brackets: These are the metal or ceramic braces that are placed on each tooth. O-Rings: The single rubber colors we put around the brackets to hold the wire in place. 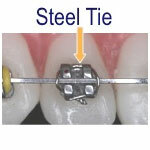 Steel Tie: A thin metal wire that is tied over the wire around one bracket, for a secure hold, and it takes the place of an O-ring. 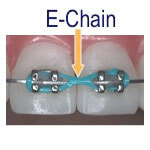 E-chain: The rubber colors that are connected in a line and are put around the brackets to help close spacing and hold the wire in place. 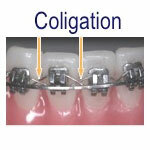 Colligation: A thin metal wire that is criss-crossed around the brackets under the wire to help keep the space closed between the teeth. 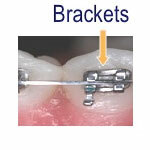 Elastics: Small special “rubber bands” that placed over the hooks or Koby ties. These are used to move your teeth into their proper places. 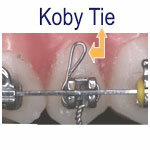 Koby Tie: A metal hook that is added to a bracket that does not have its own hook so that elastics can be placed. 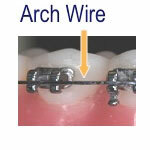 Wires: Arch wire that goes through the brace slot to help the teeth move. 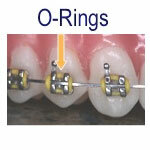 O-rings hold the wire in place. 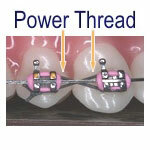 Power Thread: Either clear or grey thin elastic thread that is weaved under the wire around the brackets to help close space. 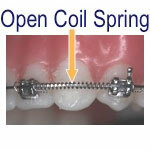 Open Coil Spring (OCS): Metal spring that is open and put in tightly between two brackets to help open up space between two teeth. This spring is put through the wire. A tooth that is coming in might not have enough room to come through so Dr. L uses this to help make room. 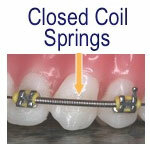 Closed Coil Spring (CCS): Metal spring that is closed to help maintain space between two teeth. This spring goes through the wire. If there are two teeth with brackets and one in the middle of them without a bracket or the baby tooth fell out Dr. L will use this to maintain the space.